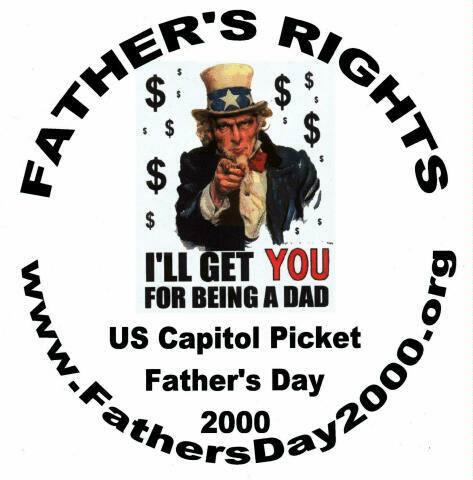 Father's Day 2000, a march scheduled for June 18 will unite father's rights groups from across the nation in Washington, D.C.
Gregory Romeo, national coordinator for the march, has not seen his two boys in over a year and says he blames judges, attorneys and the family courts -- a group that make up what Romeo calls the "Divorce Industry." According to Romeo, children are nothing but commodities in the family courts, and single mothers are looking for easy money. "Most single mothers have several children from different fathers and they don't work," he claims. "All they want is that child support check." Along with holding judges and attorneys accountable for "destroying lives" and "outlawing child support," Romeo believes that any allegations against a father should be proven in court. Romeo's not alone in his thinking. Stephen Baskerville, spokesman for Men, Fathers and Children International and a professor of political science at Howard University in Washington, has written extensively on fathers, the divorce industry and child support. In Baskerville's article, "Are Fathers Getting a Fair Shake From the Child Support System?" he writes that divorce "is nothing less than the criminalization of fatherhood: Fathers turned into criminals not by anything they have done but by the power of the state to seize control of their children..." Baskerville believes it's time for a congressional investigation and that "the divorce industry is the most dangerous violator of constitutional rights in America today." Romeo first became involved with Father's Day 2000 when he was doing research for his own divorce and came across David Wilson's web site, Father Awareness Rights Custody Equality (F.A.R.C.E.) The past two Father's Days, Wilson has sat on the Capitol steps protesting for father's rights. In 1999, 150 protesters joined Wilson, and Romeo hopes that this year's protest will grow even larger. "I get up to 400 e-mails a week, and not just from American fathers but from fathers in England, Sweden and Australia. This is an international problem," said Romeo. The marchers will gather at the Ellipse and conclude with a rally on the steps of the U.S. Capitol Building. All men, married or unmarried, with or without children, are invited to attend. The same organizers will concurrently hold a week-long protest taking place at the Capitol building and the White House. Father's Day 2000 will be the first time all the groups will unite and work together, said Romeo. It will be a chance for them to network and make plans to address legislators and the nation. "We've had enough. Our kids are suffering, and fathers are getting raped by the Divorce Industry." 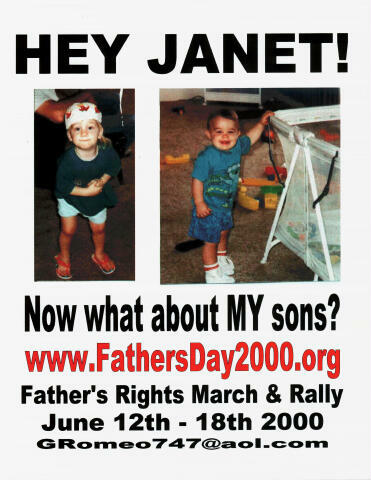 For more information check out the www.fathersday2000.org website.